The type of closure you need depends on your application, strap size and tools used. Universal's wide variety of closures enables you to choose the best closures for your application. Our "UWB" series, designed for easy threading, delivers the ultimate in high -load performance. It has outstanding slip resistance due to its self lock feature in order to maximize holding power. Our "UPB" series offers both flexibility and durability. It is constructed from a special resin and features slipresistant grippers to offer an excellent buckle for plastic application. Our "USL" series is manufactured from the finest raw materials and is rust resistant. They are available on the market. Our Combination Seals, manufactured in Switzerland, are made of first seal raw materials. The single feed seal features serrated teeth inside the seal to increase the friction between the strapping and thus provides increased holding power. The magazine seals are stacked and held together for easy dispension. The next seal automatically positions itself for next strapping. For both use with both steel and non-metallic strapping. 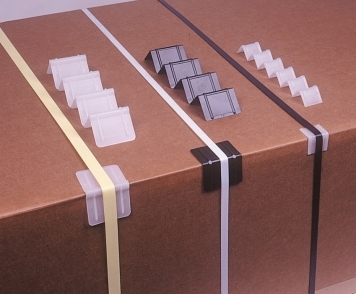 The corner protectors safeguard a package by distributing the load over a greater area, enabling you to tighten the strapping to its maximum tension without damaging the package.